In the early morning of 28 November 2016, near 04:40 UT (05:40 am local time), a bright, slow fireball with an extremely long duration occurred over the Netherlands. 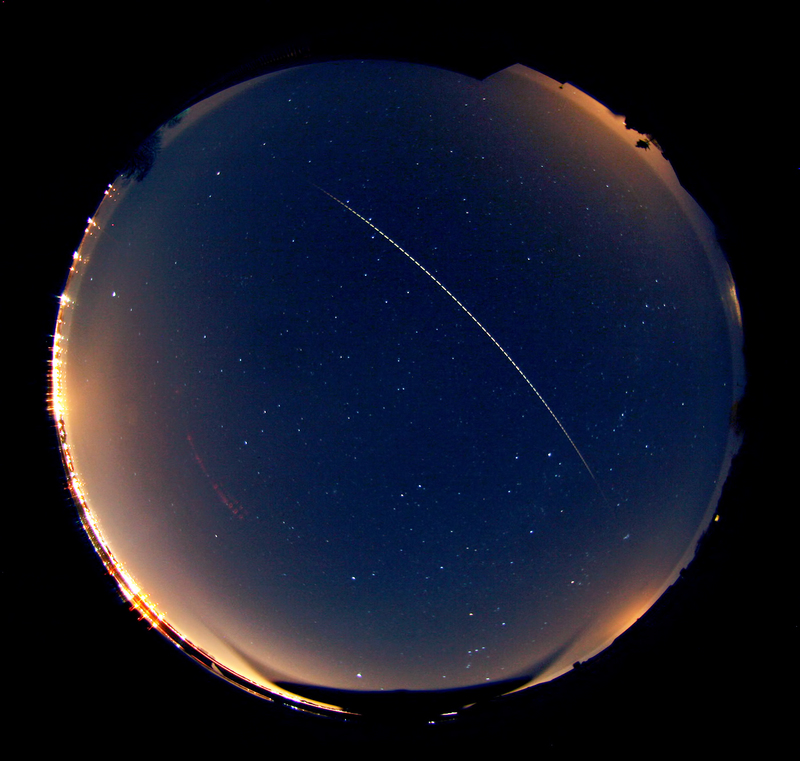 The image above was captured by the all sky meteor camera of Jos Nijland in Benningbroek and shows how the fireball trajectory spanned much of the sky. This camera was equipped with a rotating shutter, and the number of breaks visible in the trail amount to at least 13.8 seconds visibility. That is very long for a fireball. With such slow, long duration fireballs, one of the first questions asked usually is: is it a meteor, or is it the re-entry of artificial space debris? In this case, the analytical results clearly show it was not an artificial object, but a meteoric fireball of asteroidal origin - i.e. a small chunk of asteroid entering the atmosphere. A total of 7 all sky photographic cameras captured the fireball: apart from Benningbroek (Jos Nijland) shown above, it was also captured by stations Ermelo (Koen Miskotte), Oostkapelle (Klaas Jobse), Utrecht (Felix Bettonvil), Bussloo (Jaap van 't Leven), Borne (Peter van Leuteren) and Twisk (Marco Verstraaten). Benningbroek also captured the last few seconds of the fireball on video with a CAMS camera. Koen Miskotte in Ermelo in the center of the Netherlands also observed the fireball visually, estimating it magnitude -5. He reported fragmentation. The photographs allow to reconstruct the atmospheric trajectory, speed, radiant point and heliocentric orbit of this fireball, and whether something survived at the end or not. 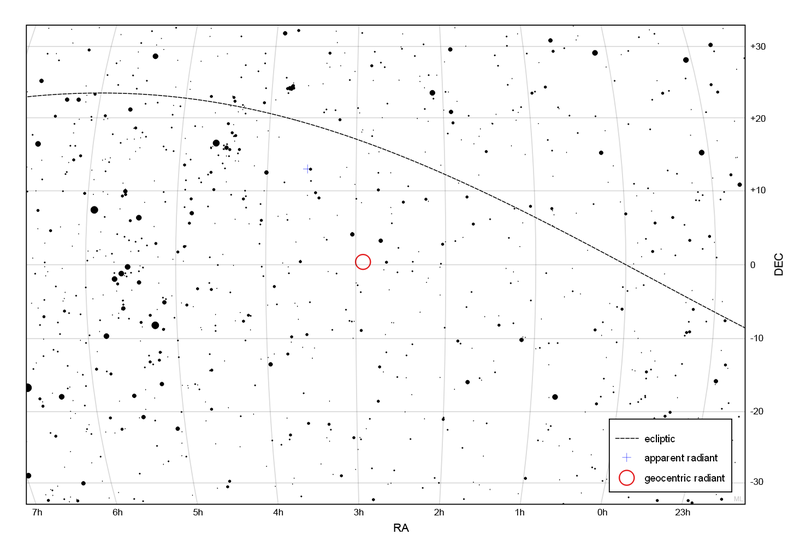 The fireball appeared between 04:40:26 and 04:40:40 UT. It entered the atmosphere on a grazing shallow angle of only 11.2 degrees. 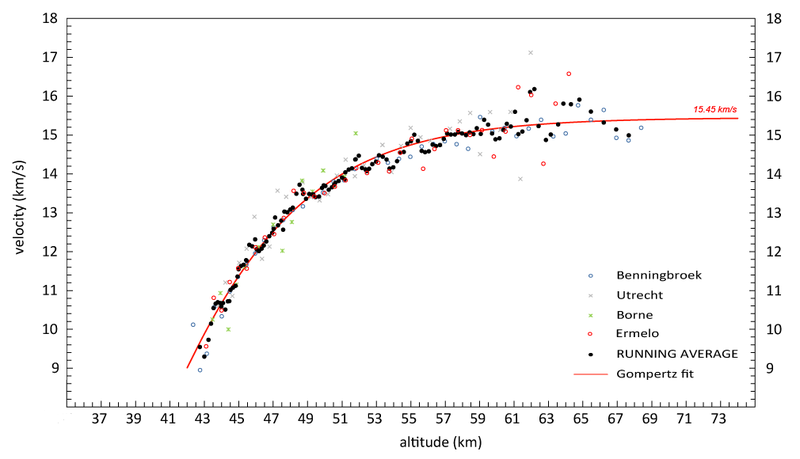 The trajectory was over 180 km long - the average trajectory for all stations combined is 183 km long, but some stations captured an even longer part, with Benningbroek topping all with 212 km trajectory length! 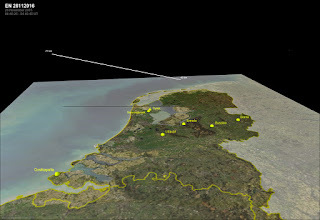 The fireball started over the North Sea at an altitude of 77 km near 53.0 N, 3.1 E (average of all stations), and moved on an almost due West-East trajectory, over the tip of North Holland province and Lake IJssel, ending at 42 km altitude over the northern part of the Noordoost Polder near 52.8 N, 5.7 E.
Four of the 7 stations were equipped with a rotating shutter in front of the lens, allowing speed reconstructions. 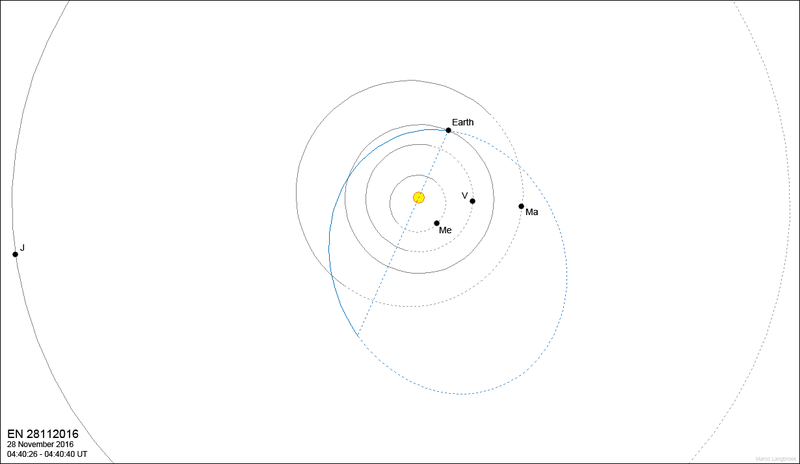 Combined with the radiant point determination, this yields the orbit in the solar system. 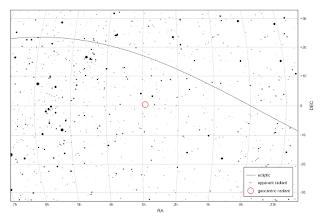 The apparent radiant of the fireball was low in the western sky, at RA 53.2 degrees, DEC +13.0 degrees in Taurus. The geocentric radiant (the radiant point corrected for amongst others gravitational influence) was at RA 43.8 degrees, DEC +0.4 degrees. 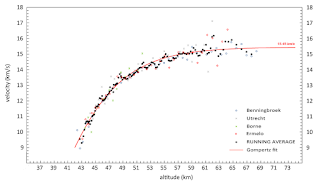 The geocentric speed was 11.1 km/s. 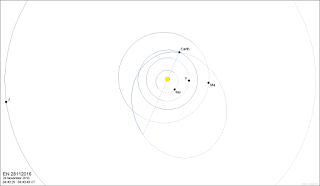 The resulting heliocentric orbit is that of an Apollo asteroid, with perihelion at 0.874 AU, aphelion squarely in the asteroid belt at 2.76 AU, an orbital eccentricity of 0.518 and an orbital inclination of 4.9 degrees.